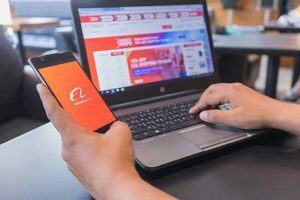 Alibaba Group Holding Ltd. (NYSE: BABA) is one of our favorite stocks at Money Morning, but buying shares of BABA isn't the only way to make money from the Internet giant. We've uncovered a secret profit play that could climb roughly 70% in the next 12 months. Alibaba Chair Jack Ma is on a buying spree, purchasing food-delivery startup Ele.me in April for an implied valuation of $9.5 billion. He then bought e-commerce platform Daraz in May for an undisclosed amount. And the company we're about to mention is on his radar. In fact, if he wants to beat rival Tencent Holdings Ltd. (OTCMKTS: TCEHY) in the race to dominate China's messaging and social media scene, he needs to own this company. SINA Corp. (Nasdaq: SINA) operates Weibo Corp. (Nasdaq: WB), a social media platform with 411 million monthly active users (MAUs) as of Q1 2018. It's considered the Twitter Inc. (NYSE: TWTR) of China. SINA spun off Weibo in 2014, but it owns 46% of WB and has 72% of the voting power. Alibaba owns 32% of WB. Now, it's true the Weibo stock price has climbed 454% over the last five years, while the SINA stock price has climbed 127.39%.